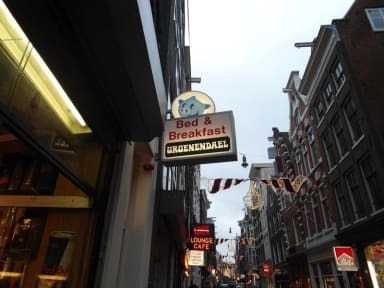 Bed and Breakfast Groenendael i Amsterdam, Nederländerna : Boka nu! Had a good visit at this hostel, the staff where nice and let us change room when we asked. Satisfyingly clean but kind of worn, not a luxury place but defenerly good value for the money. I was also nice to have a basin in the room when there wasn't a private bathroom. Very basic accommodation with shared toilets and showers, but definitely worth the money. Perfect location and friendly staff. 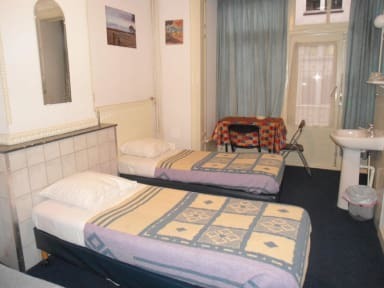 I would recommend it for people our age with reasonable expectations who don't plan on spending too much time at the hostel. Very shabby, stains on the sheets, smelled weird. Good for low budget travelers, and you did feel safe. You got to pay for the key (10 euros), but you got the money back when you checked out. They didn't accept credit card. Not a lot of options in the breakfast, you could only choose between tea or coffe to drink. Close to the train station where the tram went throughout the whole city. Overall, a good but shabby low budget B&B!